Smart Tags really ARE smart! Each tag has a unique fingerprint that enables whoever finds your Smart-Tagged item to let you know they've found it, either by scanning its QR code with an app on their smartphone or by simply visiting the Smart-Tags web site and entering the tag's ID. Smart-Tag owners can add as little or as much information to each tag - a contact number, an email address, travel itinerary, whatever, wherever and whenever they choose. Try a Smart-Tag for FREE! 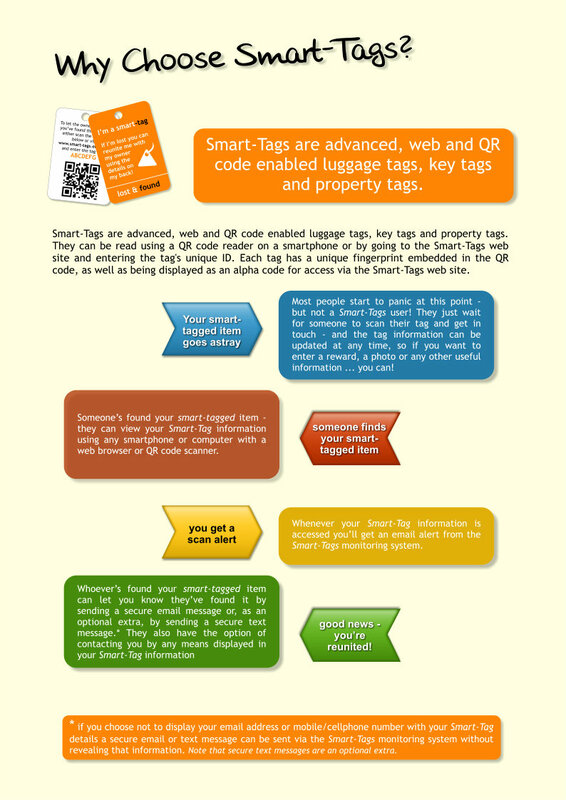 Smart-Tags are advanced, web and QR code enabled luggage tags, keys tags and property tags. Available as Smart Luggage/Property Tags and Smart Key Tags, they're strong, durable and weatherproof - and GREAT value for money! Millions and millions of bags are lost or misdirected by airlines EVERY SINGLE YEAR - some owners never see their luggage again! Protect your luggage, keys and other valuables with Smart-Tags and get peace-of-mind whenever and wherever you travel. Smart-Tags are advanced, web and QR code enabled luggage tags, keys tags and property tags. They can be read using a QR code reader on a smartphone or by going to the Smart-Tags web site and entering the tag's unique ID. Each tag has a unique fingerprint embedded in the QR code, as well as being displayed as an alpha code for access via the Smart-Tags web site. Smart-Tags currently available are Smart-Tags Luggage Tag and Smart-Tags Key Tag. Unlike similar products which are made from laminated, synthetic material, Smart-Tags are made from 760micron plastic (the same as credit cards) - they're strong, durable and weatherproof. Smart-Tag owners can add as little or as much information to each tag as they wish - a contact number, an email address, travel itinerary, whatever, wherever and whenever they choose. All they need to do is log in to their account on the Smart-Tags web site. All information is protected by encryption using an SSL certificate. As an added bonus, the high visibility orange Smart-Tags also aid in quick and foolproof identification of your own luggage. It is not unknown for someone with the same type of suitcase to walk off with another's by mistake; the bright orange Smart-Tag hanging from your case should ensure this does not happen to you! Also, spotting that bright orange tag on the baggage carousel means you'll spot your own luggage much more easily. For those who want a more discrete tag for their luggage we have Smart-Tags Black Edition - a subtle matt black tag that will look great on even the most expensive luggage!